There are two words that elicit a deep sigh and considerable head-shaking from backyard and commercial vegetable gardeners: tomato blight. 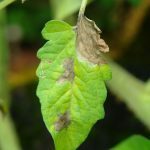 Of the tomato blights, the deadliest is late blight caused by Phytophthora infestans, which infects some members of the Solanaceae plant family, especially tomatoes and potatoes. Although this pathogen superficially resembles a fungus, it is an oomycete that is more closely related to brown algae. This is the culprit that produced the Irish potato famine in the 1840s, so to say it’s a problem is an understatement! For the home gardener, late blight is the destroyer of a beloved summer treat—a freshly picked, vine-ripened tomato, bursting with flavor and warm from the sun. The pathogen overwinters in infected potato tubers. Its spores are carried by the wind, which means that it spreads easily. Once it starts, it is next to impossible to stop. Tomato late blight foliar lesions. 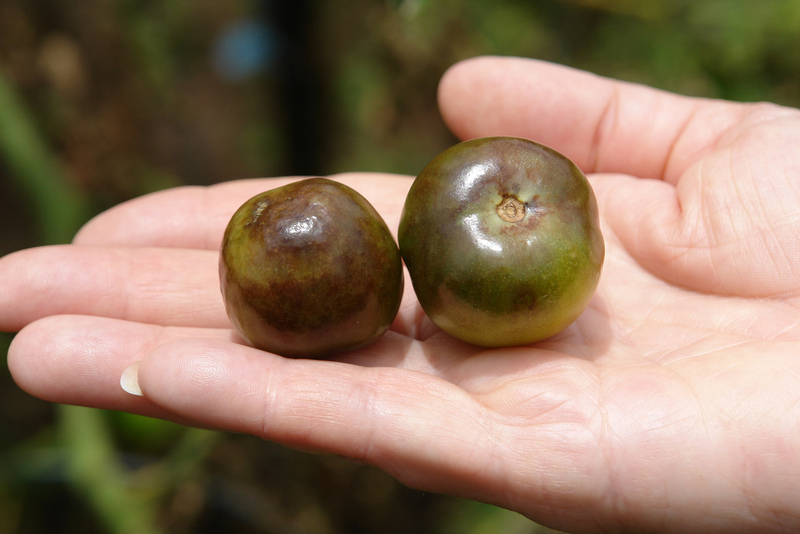 Late blight damage to tomato fruit. Tomato late blight stem lesion. Don’t be fooled by its name. Late blight isn’t limited to later in the growing season. It can develop anytime between early and mid-season, depending on weather conditions, and it is a threat wherever tomatoes are grown. The very things that tomatoes need to grow create conditions favorable for Phytophthora infestans to take hold—plenty of moisture (rain, dew, irrigation, and fog) and temperatures between 64 and 71°F. Under the right conditions, the disease lifecycle can occur in as little as five days and can spread quickly any time humidity is over 80 percent for two days or more. 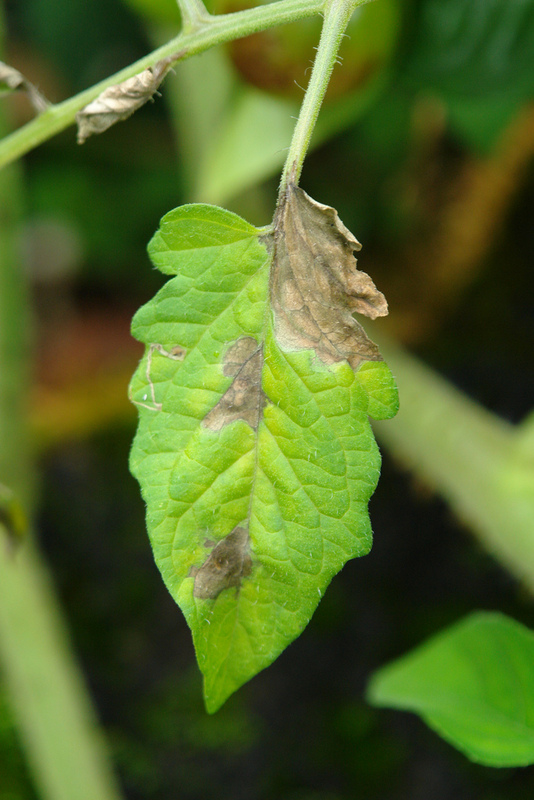 There are many days when conditions are just right in WNC for tomato blight! 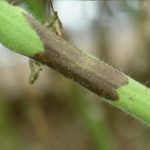 It is for this reason that NC Cooperative Extension tracks and reports where the disease is appearing and how quickly it is spreading from farm to farm and county to county. You can also follow the disease each year through the USA Blight website (https://usablight.org/). Phytophthora infestans is a formidable adversary for any gardener and requires multiple strategies to combat it. Prevention and control are particularly challenging for organic gardeners and farmers. Choosing the right location for tomatoes can help. Full sun, good air movement, reduced leaf wetness, and well-drained soil all help plants stave off the blight for as long as possible. Chemical products may slow down the spread of blight, but need to be applied frequently and on ALL plant surfaces with every application. It’s a lot of work. There is some good news on the horizon for tomato growers worldwide! 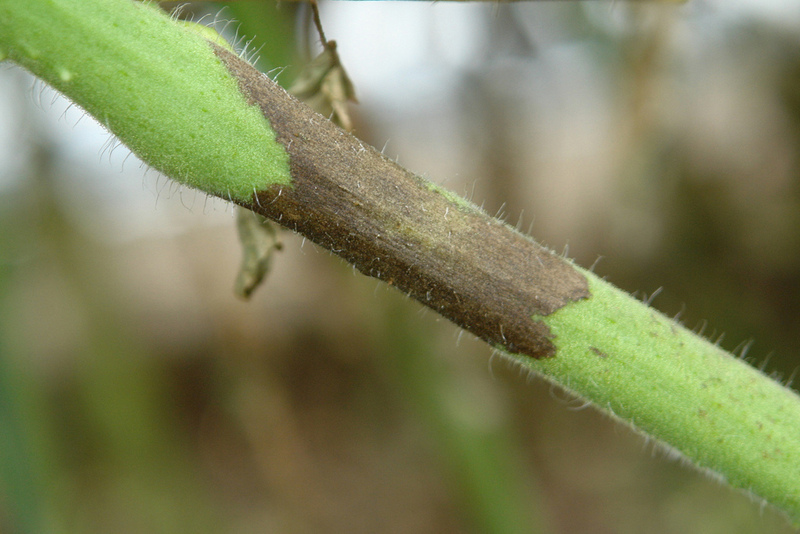 Unlike infected potato tubers, tomato seeds do not transmit the blight pathogen. This makes it possible for researchers at Western North Carolina’s Mountain Horticultural Crops Research and Extension Center in Mills River, Henderson County, to develop tomato varieties resistant to Phytophthora infestans and many other tomato diseases. Dr. Dilip Panthee, Associate Professor of Horticulture at North Carolina State University (NCSU), leads this research. 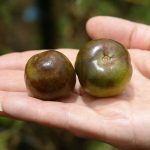 Developing disease-resistant, higher-yielding plants for North Carolina’s $30-million-a-year tomato industry will reduce the global economic impact of diseases like Phytophthora infestans. Working with NCSU professor emeritus Randy Gardner (the man behind ‘Mountain Pride’ and many more tomato varieties), Panthee developed ‘Mountain Merit,’ a high-yielding, fresh-market cultivar that is resistant to three tomato plant problems—late blight, tomato spotted wilt virus, and root-knot nematodes. Panthee also developed ‘Mountain Majesty,’ a large tomato with improved fruit color and resistance to tomato spotted wilt virus. Both are commercially available. Because the Mountain tomato series (‘Mountain Pride,’ ‘Mountain Rouge,’ ‘Mountain Merit,’ and ‘Mountain Majesty’) was developed here in Buncombe County, it is well-suited to local growing conditions. You’ll find one or more of the cultivars in the series throughout the planting season at area garden centers. To learn more about the important tomato breeding work being done at the Western North Carolina’s Mountain Horticultural Crops Research and Extension Center in Mills River, go to http://mountainhort.ncsu.edu/fletcher/programs/tomato/. Better yet, plan a visit in late summer 2017 for Tomato Field Day, talk to the experts, and taste the fruits of their labors.